With a Msc in chemical and biological air quality, Pascale is a specialist in Environnement Odour Management. 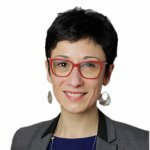 She is also Co-Director at Odournet France and leading the consultancy team. She has completed various projects in the waste water and waste sector.